There I am. I’m sitting on the balcony of a beautiful wood cabin, staring out into the wilderness, listening to the sound of elephants roaring somewhere at the foot of the nearby hill. Flashes of lions and giraffes and cheetahs and black rhinos and warthogs appear in my head. 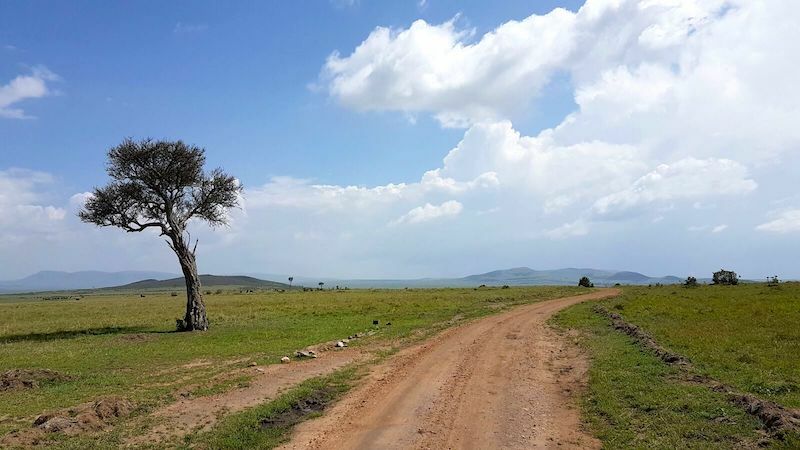 Flashes of massive green mountains and never-ending savannas dotted with wildebeest, zebras and those unique and surreal acacia trees appear as well. This is not a dream. It all really happened. 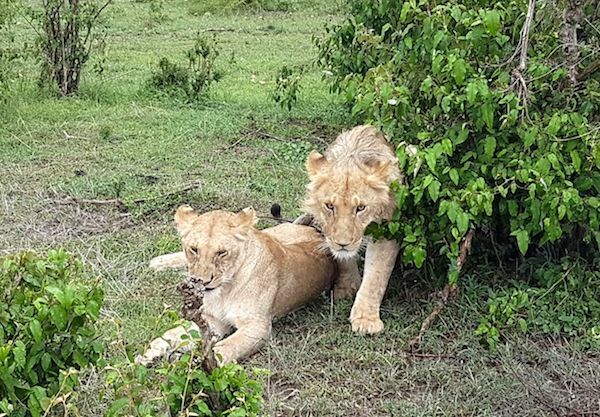 For 10 hours we were out there on safari in the Masai Mara National Reserve in Kenya, encountering a crazy variety of wildlife in every direction, bouncing across the beautiful landscape in our 4WD vehicle and walking along the banks of the Mara River. It was a most epic travel experience, even under the strictest of definitions, the kind of day that could easily be classified as once-in-a-lifetime. And as I sat there on that cabin balcony, after the safari had ended and as the night rolled in, all I could do was…complain. Oh did I complain! I was complaining that I was far behind with my work and had emails I needed to respond to. I was complaining that the internet wasn’t working properly at our remote safari lodge and that I had yet to start a new project that I had hoped to start by now. I was grumbling about my nostrils being clogged with dust and about not sleeping so well the night before…I don’t know…I was complaining so much that I think I even mumbled nonsense about my flip-flops being dirty and even about the staff at the lodge being too attentive. Yes, TOO attentive. I was on a roll, locked in and shooting off complaints rapid fire. A once-in-a-lifetime experience just ended, the kind of experience that, while growing up, I never would have imagined possible for an ordinary person like myself. Now here I was, in a most gorgeous corner of the planet, in Kenya for crying out loud, only minutes removed from a most perfect day in the wild, and all I could do was complain. It happens, I know that. Nobody is perfect. But still, it was not one of my best moments. Lucky for me, I had someone there to listen to my complaints and to then reply with a few choice words and a few very clear facial expressions that immediately snapped me out of my negative trance. Sometimes we have someone there to help us, sometimes we need to wait until we figure it out on our own. Either way, it’s indeed helpful to be reminded every now and then that sometimes we do need to forget ourselves and just ‘be’. Just sit there, open our eyes, look around and appreciate everything we have, everything we have been fortunate enough to experience and every person that is important to us. When we can return to being present and forget about life’s little frustrations, when we can remember that those little frustrations should not control us and that they have far less value than we tend to give them, we can then discover a pretty powerful and genuine happiness that really is impossible to match. If we’re living in the past or the future instead, there’s a high chance of being engulfed by a general unhappiness built upon regrets or fear. We know this already of course, but yet we still lose our way, probably more often than we’d care to admit. And when it comes to appreciation, I’m not talking fluffy stuff here. You don’t need to appreciate for the sake of appreciation or force yourself to appreciate a leaf blowing in the wind or your daily cappuccino. But seriously, isn’t there something real and meaningful that takes place almost every day, something we witness or participate in or some interaction we have or some set of moments we thoroughly enjoy that we can and should be really thankful for? Anyway, let’s be present and appreciate. We don’t need lions and zebras and hippos and an epic travel experience to do that. Goats and cows and everyday moments can do the trick too if we’re paying attention. As for me, I actually had the lions and zebras and hippos right in front of me and I still messed it up and got off track. Complaining about wifi and nostril dust was simply absurd. Well, lesson re-learned. Back on track I am and hopefully for a long time to come. Yes 🙁 On “bad” days, even the pettiest things frustrate me and I hate myself for it. But thank you for this reminder! Truly. I don’t actually complain at all on trips as I am there trying to enjoy the moment. Plus, I have had experiences on tour groups in the past where other people have complained incessantly, which started to affect my enjoyment of the trip as well. So, I try not to be “that person.” The only thing I am guilty of doing on trips from time to time is already thinking ahead to my next trip before I have even finished the current trip that I am on. Or of the stories that I am going to tell friends and family back home. I have to learn to just “be” in that case and forget about the future. Yes Thanks Earl for sharing. I really enjoyed this post, Earl. Thank you for sharing. And thankfully only once! My German husband and I were in the Dominican Republic & in the Caribbean for the very first time. We were in a 5 star hotel and the staff were lovely. I didn’t like our room. It was changed. I didn’t like that room either! We changed our room 4 times, and in the end they gave us the best suite in the house. I wasnt at all satisfied! I hated the food! I also announced that the staff couldn’t even make a decent cup of tea, and that it stank! The staff did everything they could to make me happy, but to no avail, so that even my husband began to worry that something was horribly wrong. When we got back to Berlin, we received the happy news. We were pregnant! Phew! I remember you and your husband, I was one of the Staff. …. lol, I do customer service and know what the staff went through. We humans can be so silly sometimes. One day you’ll look back and have a good laugh about it. “Everyday is a holiday, every meal is a feast” This is a quote from my Marine husband. Thanks for sharing your adventures Earl. Best wishes! This has happened to me more times than I’m proud to admit. I know exactly what you mean – you end up feeling ungrateful as hell for being part of an incredible experience and complaining. I was in Madrid this weekend, frustrated because I was trying to get a sunset shot and one place had its viewing terrace out of order, but no one told me until I had waited 25 mins to get up there, and the other good sunset spot had a three hour wait by the time I got there (meaning I’d miss sunset by 2.5 hours). I was annoyed at everything, from the big to the petty – the fact that I couldn’t communicate well with anyone, the fact that none of the elevators I had used in Madrid seemed to function normally and half of them simply refused to work at all, the fact that I had one day to get this great sunset shot and I missed it. Then like you said, I took a breath, looked around me at the gorgeous sky and streets, and took a moment to realize what a damn fool I was being. It’s one sunset shot. I’ll live. An excellent daily routine is to spend the first hour after you get up in the morning, in a conscious meditation of gratitude. This really grounds you in the here and now, so you live in present time, not in the past nor in the future. It pulls all your energies into the present time where you should be. By doing this you form a good foundation for your day, filled with a lot more joy and happiness. You will find that you attract more of what you need and want into your life too. Derek Thank you!!! Yep! Just was talking to someone about how once done with an epic adventure I looked abck and wondered was I really in the moment? Will take your post to heart as I sit outside Joshua Tree National Park ready to ride my bike across the park yet it’s way to windy. Well then I’m going to appreciate just looking out at the beautiful scenery!! Love what you said here. It’s something to be practiced again and again. And then some more :). That’s my experience. This is the thing we love about your writing, the real struggles about traveling. Sometimes the stress from the logistics and situations makes me forget about why we travel in the first place. Thanks for being so real with us, Derek. It would be easy enough to portray yourself as Mr. Always Happy. By being vulnerable enough to show us your flaws, you help us to forgive our own less-than-stellar moments. Travel challenges us by pushing us out of our comfort zones, and sometimes when we are uncomfortable, we complain. Fortunately, when we travel by choice, we also have the opportunity to take note of our discomfort, stop complaining, and recognize that this discomfort is yet one more growth experience. Thanks for sharing your stories. I enjoy and benefit from them, especially as I am just beginning my travel adventure. I relate to this so much. When I look back at my old travel journals and remember the petty things I complained about while I was on a trip many people could only dream about- ugh. Not my proudest moments for sure. Love you blog! I think you are becoming wiser and more introspective which is actually wonderful to “see” through your writings. You are definitely growing in your jorney. And that is refreshing. 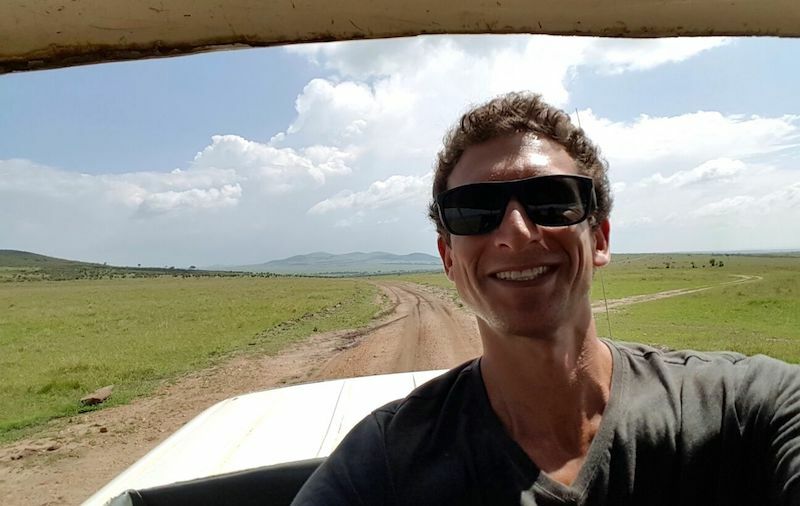 Seems you had a tough time in Kenya – first in Nairobi, then at the Mara. I travel a lot too and I do complain when necessary. Last year though at a Swiss resort town I complained (albeit to myself) of too much chocolate in the hotel. Yes really! Whenever I got to my room in the evening a house keeping person would appear seemingly from the woodwork, knock on my door, and when I opened they’d ask ‘is everything alright?’ while sticking some chocolate into my hand. By the 3rd night I was getting very irritated by this gesture. Eventually when I got round to saying ‘no thanks’ the irritation and complaining ended. I hope to read something you enjoyed while in Kenya my home country. I can most certainly relate to this. Perhaps it’s the bane of being a traveller, we get grumpy sometimes. I’ve found it particularly difficult as I’ve grown older and the things I have to do seem to expand and expand. So, I often wake up overwhelmed by the multitude of tasks on my to do list. But the paradox is, this kind of mindset stifles my creativity. I write my best work when I can create the illusion I only have one thing to do. When travelling, I try my hardest to be a good observer no matter how tired I am. This allows me to write about my experiences more viscerally later on. Grouchiness and curiosity, in my experience, don’t go hand in hand. Thanks for writing this. In a world of hurry, hurry, it’s all to easy to forgot to stop and take a deep breath. Oh please! My experience has been so frequent in my 3rd decade of life, I’m fortunate to have been given a second chance by friends I do not deserve! Chemically imbalance by the shooting stars of hormones. But, had I recognized the underneath reason sooner, my circle would have been so much calmer. “Women brew”. Aging as been the only true remedy. To overcome my discomfort of my present is to think of those who have nothing at all, and my complaints are irrelevant and embarrassing. I avoid complainers, so I agree, thankful for your friend who mirrored you and brought you to a check point. Happy travels! Hello Earl, thanks for your posts and your blogging about your life. I’ve been reading them for a few yeas now. “As for me, I actually had the lions and zebras and hippos right in front of me and I still messed it up and got off track. I spent a lot of my travels in Africa, starting in 1983 hitch hiking from Germany via Spain, Algeria, Niger to Cotonou Benin. My journeys always make me slow me down and humble me. Now more so than when I set out I voluntarily go to this pace and open attitude. Personally I have not been able to experience the depth of a journey where I am alive and immersed in life when consuming packaged or guided adventures as a traveler or tourist. I imagine it is possible, but when we purchase a service we negotiate the content up front and naturally have expectations. And then of course, not cutting my ties with my everyday experience in the western world, as in checking email and keeping in frequent touch with people that are not present, adds another serious complication toward being present in space and time. I find meditation the tool of choice for myself. but mostly, I do not see lessons to be learned or time as linear, it is just a matter of practicing it again and again, and than some more. kind of like practicing a sport or a musical instrument, the mind needs to be played just right to stay in the presence. …. anyway, hope this was not too esoteric and still helpful for one or two people out there. either way, Peace to all of us. We did Masai Mara a few months back on a quick 2 night trip from Nairobi and loved it. A week later we spent 5 days in Kruger driving around ourselves (we did take a guided morning walk and a guided night time drive). We loved both experiences but I must say it was something special to be your own driver and decide where, when and for how long to drive and stop. Since we don’t travel full time (about 6 months each year) my “funks” are always back at home, never on the road and invariably occur when I’m not feeling well. My wife never gets like that (I’m serious!). Thanks for sharing your feelings. You gotta make a living, which can be difficult, but you gotta live while you’re alive. Good post and good point! I had that sort of experience my second year at the ski resort I worked at in NZ – things weren’t meeting my expectations. Of course, like you, I should have remembered my own philosophy: low expectations make for great experiences. On the other hand, I do think it’s a bit tougher when you’ve been traveling for years… I don’t know about you, but sometimes I feel like it’s hard to get that same appreciation that I started out with. It’s like everything is so anticlimactic after a while and these “once-in-a-lifetime” experiences that, as with you, didn’t seem likely when I was growing up, have now become standard “meh” experiences. Makes ya feel like a spoiled brat! Well, and maybe you can relate, but sometimes I find that I have to wait until I’m writing about it before I finally get that nostalgic “wow” feeling that somehow eluded me during the actual experience… does that sound familiar? There you go again, complaining about complaining. 🙂 I’m not going to get all philosophical about that part of life. We all have times that nothing seams to go right. At the time, it’s hard to see the positive side of anything. Then, hopefully, the light goes on. Today, I have nothing to complain about because I just purchased my ticket to Ho Chi Minh City, the starting point of five months in S/E Asia. I’ve got 10 days to get my “To Do” list finished. Hardly time enough to do any complaining. My life and this trip has been in the planning stage for way too long, but I never gave up. Here’s my one complaint to you: Can you keep us a little more informed of your plans for the future and where you plan on being/going? How are we supposed to ever meet up to have that beer? The only time we hear from you is after you’ve been there and done that. Are you on the lam? There; there’s my gripe for the day. I’m generally not a complainer, but now I feel better. 🙂 A complaint now and then is therapy, but just don’t make a habit of it! Great post. I like the way you weave your point in with such a wonderful experience. No, not really. But I live surrounded by goats, pigs, sheep and chickens. They make me very happy indeed.Even though we’re free to go anywhere we want in the world, we choose to be here in Romania. Mostly. And now I’m going to go check out flights to Kenya. It’s happened…. Thankfully not often. Enjoy your posts. Count your blessings for they are many. Safe and happy travels. I really enjoyed this post. It was real and honest, and I encounter people on my travels so often who are in a gorgeous place and are still complaining. I can hardly believe it. I used to be like that many years ago, but finally learned the lesson. Perhaps we all learn it eventually, or sadly, maybe some never do. Good job.